“Using simple and clear explanations, practical advice, and cartoons that make the how-to guidance come alive, this book is: a rich resource for families trying to navigate meltdowns and misunderstandings. 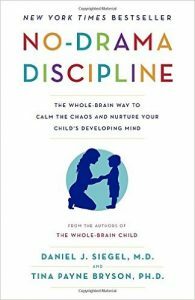 It explains how neurobiology drives children’s infuriating and puzzling behavior… and will help parents make their way through the trenches of a typical day with grace and mutual respect..
What a relief! Siegel and Bryson take the difficulty out of discipline for parents or anyone who has to help kids behave. NO-DRAMA DISCIPLINE offers a research-based, commonsense approach that any grown-up will be happy to use. and any kid will benefit from. This Workshop will be an 7 – week Session appropriate for parents of children any age – but primarily 2-15.